Fall is really here; we're walking into spider webs daily. And we want to tell the spiders that we're like 6,980,708 times heavier than the average fly, but they don't listen. They never listen. And while fall can mean many things to many people, it is increasingly meaning Halloween shopping. This is one holiday that keeps on growing, economic woes or not. It's the escapism. It's the fantasy. And it's the evil snow cones. The moment we spied the scary treat at Confetti Halloween Store in Thousand Oaks we knew we had found our ultimate scare shop. Halloween fans around town -- and there are many, after all, this being LA -- know and treasure our great costume outlets and creepy bookstores and yard-haunt emporiums. But we're always on the lookout for just one more frightening find. This is it. Confetti, which started as a party store in Agoura Hills back in the early '80s, is a mondo Halloween-a-teria that has costumes, make-up, and several dioramas that are killer. Almost literally. Owner Diki Wackenstedt and her staff have constructed an entire pirate scene, a bug-filled nightmare, and a don't-go-up-those-steps front porch, complete with creaky rocker. Oh, and a strange carnival, complete with weird clowns and the aforementioned evil snow cones. 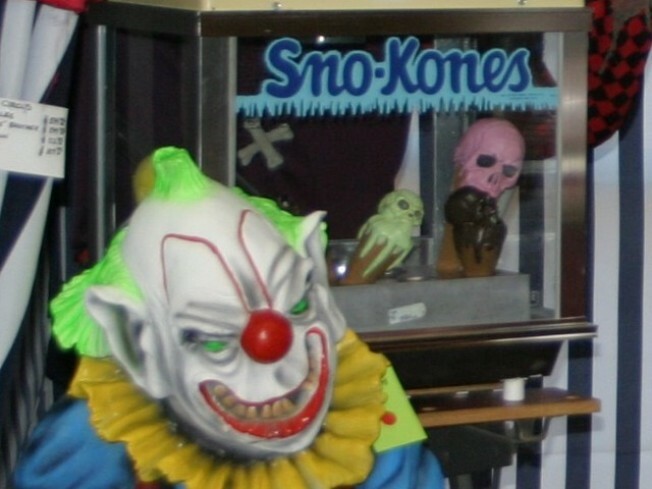 They've got little melty faces and sit inside a frozen treat cart. Talk about your party conversation piece. Like we told the easy-to-chat-with Diki, visiting Confetti is like going to a Halloween attraction without paying admission. She agrees. As she explained to us, many of the pieces on display were found at shows and sales, so they are very much one-of-a-kind. And she won't take any of the for-sale pieces out of the devious dioramas before October 26th. She's selling 'em -- you've got to check out the nightmare-inducing door in the meat market scene -- but buyers can't pick up their finds prior to the Monday before Halloween. The better for everyone to enjoy throughout most of October. Nice. Halloweeners, do the drive. The staff couldn't be friendlier, and that Diki? A character. Confetti feels homegrown and full of love, even if it makes the teeth chatter the eensiest bit. Confetti Halloween Store is located in the Janss Marketplace in Thousand Oaks.